I have never really thought of myself as a gambler, i dont even do the weekly lottery horses or any other sports betting is also a no no, i would not know how to, but its struck me yesterday that i really am a gambler. The reality is: when buying any second hand watch [ which makes up the majority of my purchases ] we all take a gamble in that someone else's idea of condition and how well a watch works can differ wildly from our own, with this in mind i suppose i take it to the next level in that i really enjoy buying non runners or watches described as spares or repairs, mainly quartz i should add. 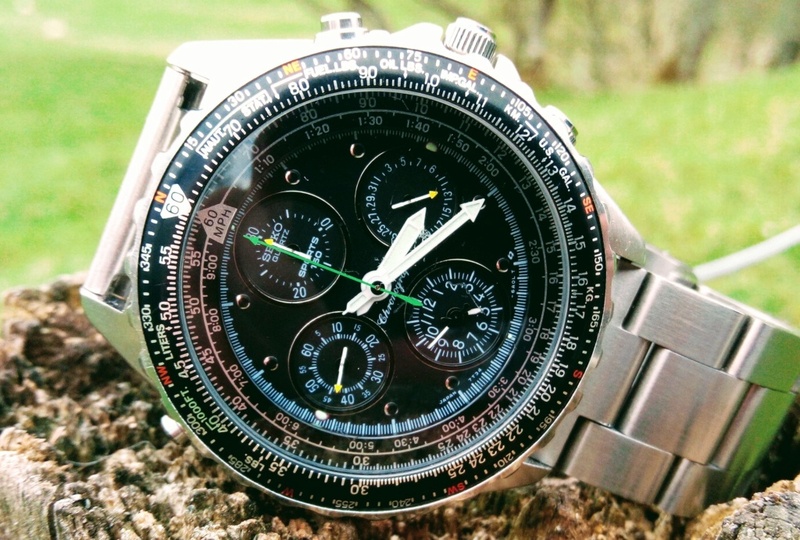 as mentioned, there are 4 subdial .....the one at 12 is chronograph minutes and only runs to 30mins, subdial three is the date, twin handed subdial 6 is alarm setting and doubles as a second time zone as well, subdial at 9 is watch running seconds with the chrono seconds in it proper place in the middle [ green hand ] this runs at 1/20th second. the dial and hands detail for me sort of mark the end of an era for Seiko watches, the quality is superb, chrono seconds green, subdial hands are white with tiny yellow tips main hands pure matt white which give a great contrast against the matt black dial making this extremely busy dial very easy to read through the gently domed crystal. 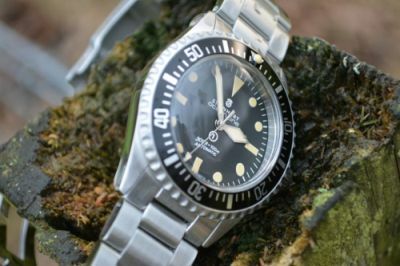 the watch measures a modern 43mm wide including the crown and has a 20mm lug gap. 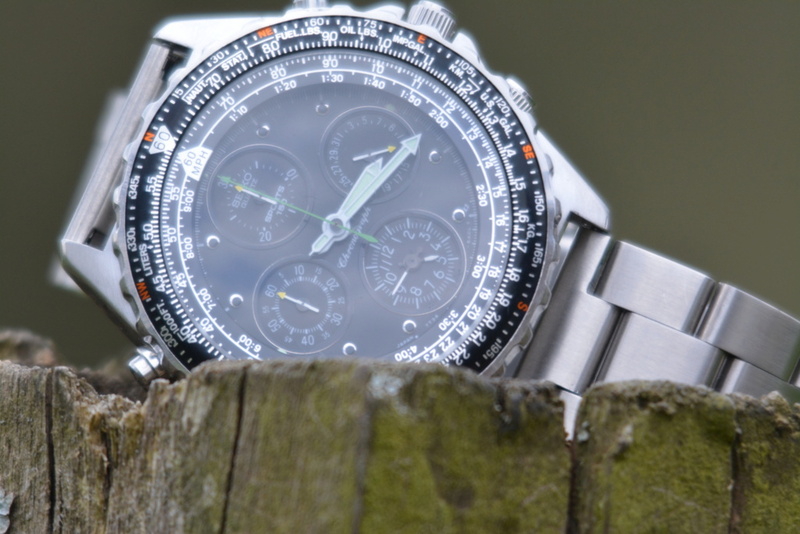 A great write up for a great watch , I like it very much. I agree you are a gambler but an experienced gambler , it is because of your gambling skills that you have the knowledge to pass on to others ie what to look out for when buying a watch , I for one have learnt a lot from you and am thankful for it ,. a prime example is the Citizen eco drive I bought as a non runner a few weeks ago I would have not thought about buying it if I did not have the knowledge I have learnt from you and it paid off because I knew how to fix it and was able to make it running again . @SeikoJohn wrote: A great write up for a great watch , I like it very much. I agree you are a gambler but an experienced gambler , it is because of your gambling skills that you have the knowledge to pass on to others ie what to look out for when buying a watch , I for one have learnt a lot from you and am thankful for it ,. a prime example is the Citizen eco drive I bought as a non runner a few weeks ago I would have not thought about buying it if I did not have the knowledge I have learnt from you and it paid off because I knew how to fix it and was able to make it running again .